goDromo Photo Editor is a minimalist photo editor that packs very common photo editing tasks in a small, quick and easy to use package. Because sometimes, less is more. Most actions you perform on your photos are previewed instantly so you can see what the final result will look like. No need to guess. 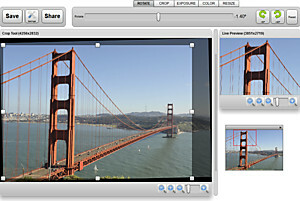 We strive to simplify very common photo editing tasks like cropping, resizing or rotating a photo online. Doing things with the editor is as simple as 1, 2 and 3! There is quite a bit more to the editor and you can learn more here. Also, don’t hesitate to let us know if you want to see some feature added or you are having some problem with it. Leave us some feedback.